Lightweight and packable rain protection for backpacks. Featuring contoured shaping with an elastic drawcord closure for a secure fit, compression straps to reduce wind drag, easy access to top of pack while cover is engaged, and stow pocket. Fits the Men's Altra 75 & 85 and most other packs up to 95L. Pack Shelter - L is rated 4.8 out of 5 by 8. Rated 4 out of 5 by Emelie from You need this one! A rain cover/pack shelter for your pack is a must. I have tried different brands and bought this one for my Altra 65 liters. It fits perfectly (covering the whole pack), even with things hanging on the outside of the pack. A plus for the two straps that helps the pack shelter stay close to the pack even in windy weather. This pack shelter does exactly what you expect it to do... it keeps your pack and things attached to it dry, in all weathers. A minus however is the colour. While it is practical with a black pack shelter, it is not very functional. When you are out in the wild, in bad weather, you want visibility. Therefore I hope Arc'teryx will update this version to include several visible-from-the-air colors in the future instead of only black. What about yellow, orange or why not pink?! Rated 5 out of 5 by grantdude from Great pack shelter I hate using the umbrella for my commute to/from work. So I bought myself a waterproof jacket and a pair of waterproof pants. And that was great. Except my backpack would get wet. So I bought this pack shelter. It fits my Sebring 18 perfectly. Keeps my back pack dry. When not in use, stuffs into the little pocket and takes very little space in my back pack. Light. All in all, excellent product. Is that a big surprise? No. Because it's Arc'teryx. I've come to expect excellence from these people and they have not disappointed me once. 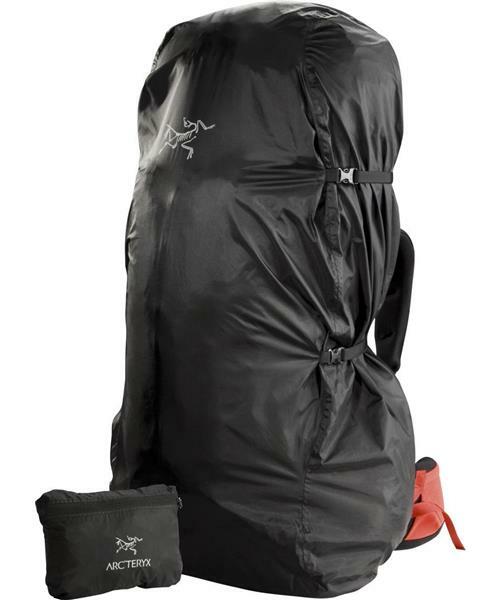 Rated 5 out of 5 by MeatballOne from Huge & Snug (and waterproof) I own the Pack Shelter in both size Medium and Large. The Medium easily swallows my Axiom 50 (L) when it's bloated with gear and the lid is riding crazily high. The pack shelter has two straps - mightily generous in length - to securely batten down the pack shelter come tug, snag, or hurricane. I've even used the size Medium with my Osprey Xenith 105 (L) without a hitch. Given, the pack wasn't busting at the seams with gear, and the pack's lid was riding low & tight, when I fitted the Medium over it. I've used my Size Medium pack shelter for all sorts of duties it wasn't originally spec'd for, among them - keeping my core dry, and thus warm, when I was caught out in the wild in the Balkans last summer during a 12+-hour torrential downpour. Boy-O-boy did that pack shelter and it's straps come in handy. Needless to say, the size Large pack shelter easily engulfs my Osprey 105 (L), even when it's stuffed. Though perhaps it's a bit disingenuous to deck out a lowly Osprey in the feathers of another bird - and not just any ol' feathers at that. Rated 4 out of 5 by henkerik from Nice and very versatile I bought this for my Fly 13 pack; the shelter is still a bit big for this small pack, but the drawcord makes it fit well enough. Quality is good and it has a handy stuff pocket attached. Rated 5 out of 5 by jazman from first day i got it, we have a terrible down pour and i was out 2+ hour on the trail dry as a bone first day i got it, we have a terrible down pour and i was out 2+ hour on the trail dry as a bone! Rated 5 out of 5 by Jimmy from light but functional Very light but highly functional pack shelter! It fits my 34L backpack perfectly. Rated 5 out of 5 by rsilva9004 from Pack Cover Ordered through company website and service was very efficient and professional. Light weight. Rated 5 out of 5 by Serviceprive from Great for this price Simple functional and correct product. Nicely finished Arcteryx product.